Each frame is .1 seconds part. In this event, Mai Nakamura went out very fast covering the first 50m in 29.17 seconds, leading Diana Mocanu comfortably at the turn. Her eventual final time was 1:00.55, showing that she paid dearly for her excessive speed in the first length. This swimmer's streamline is better than that of Diana Mocanu. The head is well back, which brings the hips up closer to the surface making the overall posture relatively streamlined. The left arm pull has some troubling characteristics. It contains a considerable vertical component in its locus of movement. A contributing feature to that observation is the arm remaining relatively long in the first half of the pull. In frame #5, there is only a slight bend at the elbow. More flexion would have kept the hand/forearm higher, which would have contributed to a pull that is more direct and powerful. It is quite possible that the exaggerated depth was needed to counterbalance the recovering right arm. To counterbalance the large lateral force component created by the long sweeping left arm, the body rotates to the left and kicks to the side, particularly with the right foot (see frame #4). The right arm enters too far behind the head (frame #7). In this entry position, no propulsive force can be generated until the arm is repositioned. It first pushes to the side. The right leg kicks to roll the swimmer to the right, which assists the repositioning of the right arm (frames #8 and #9). This is one of those unusual times when the opposite leg does not kick to counterbalance the entering arm (compare to frame #13). Rather the left arm push downward at the end of the propulsive phase serves to counterbalance the other arm's entry. 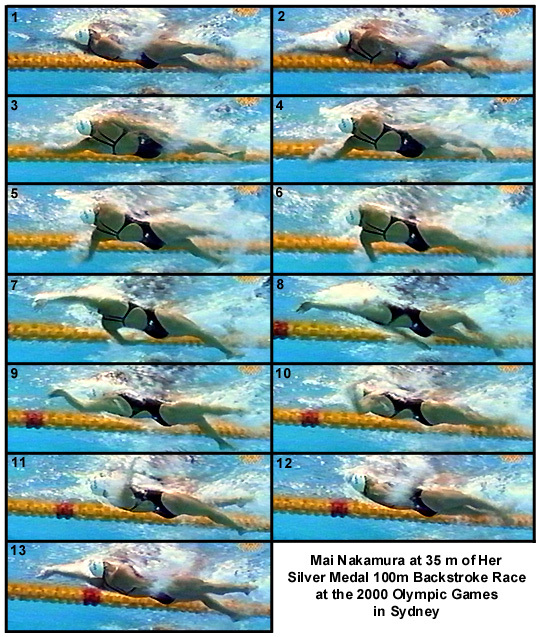 It would be to this swimmer's advantage to have the left arm exiting or pushing backward, rather than doing what is happening in frame #8. While the arm is in this position, it is not propelling but rather, creating added resistance. Once the right arm begins to pull (frame #9), it does generate propulsion off the hand/forearm-propelling surface. The movement of that surface is mostly horizontal, a good feature. Both arms do not appear to have an optimum amount of elbow flexion. More elbow bend would facilitate greater and more direct propulsive force. Only the right arm in frame #11 appears to achieve a reasonable elbow angle. From frame #9 to #11, the right elbow appears to flex progressively more in time with adduction of the upper arm. That flexion is accompanied by an increasing amount of drag force turbulence (the "milky" water trailing the arm). Increasing the angle at the elbow assists that increase. As with crawl stroke, the power for a good backstroke pull comes from adduction of the upper arm. That power is demonstrated in the left arm pull. The outward rotation of the lower angle of the scapula is seen as a bulge adjacent to the left armpit. That rotation extends the shoulder forward, contributing to effective stroke length. Through frames #3 to #6, the changing angle of the left upper arm is accompanied by the hand/forearm propulsive surface being locked in relation to the upper arm rotation in the shoulder joint. Drag force turbulence begins in frame #3 and ends in frame #7, when adduction is almost complete. This is a good demonstration of a balanced stroking pattern. Both arms mostly remain opposite each other, a feature that will reduce inertial lag between the end of one arm's propulsion and the commencement of the other arm's propulsion. Only at the left-arm finish, is that balance disrupted. However, as with most modern female backstrokers, there is a tendency not to bend the elbow optimally in the middle of the propulsive phase.